Slow cooked Kalua pig with sauteed Chinese cabbage and caramelized onions on a pizza. Serve with pineapple on the side and have a real Hawaiian pizza. 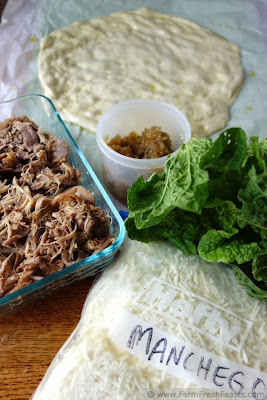 When I saw Marlene's and Dorothy's Slow Cooker Kalua Pork posts within days of each other, I knew it was the sign I needed to share this pizza. 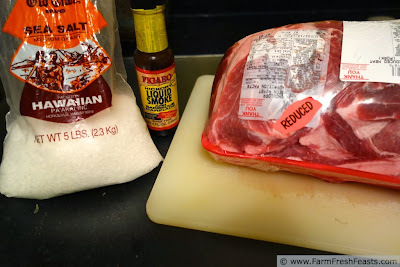 Here's how I make my Kalua Pig in a slow cooker! 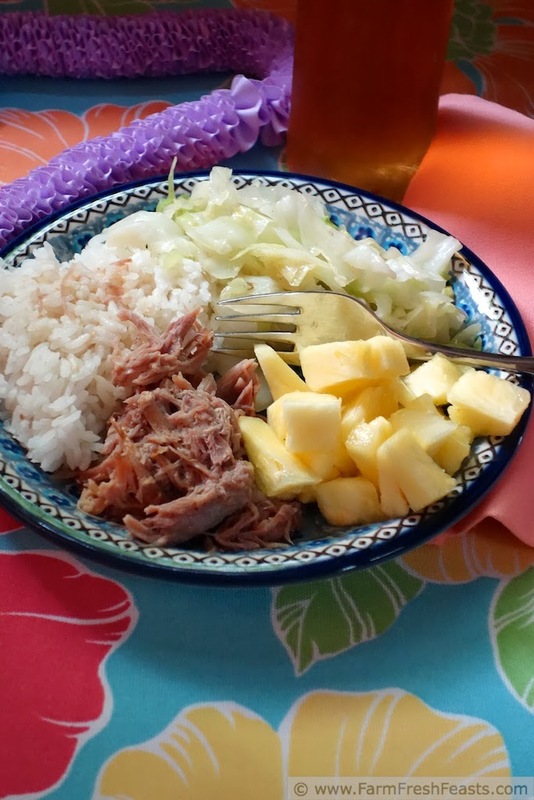 See, Kalua Pig is an ono grind, but unless you're hosting a luau you're going to have leftovers. Lots of them. 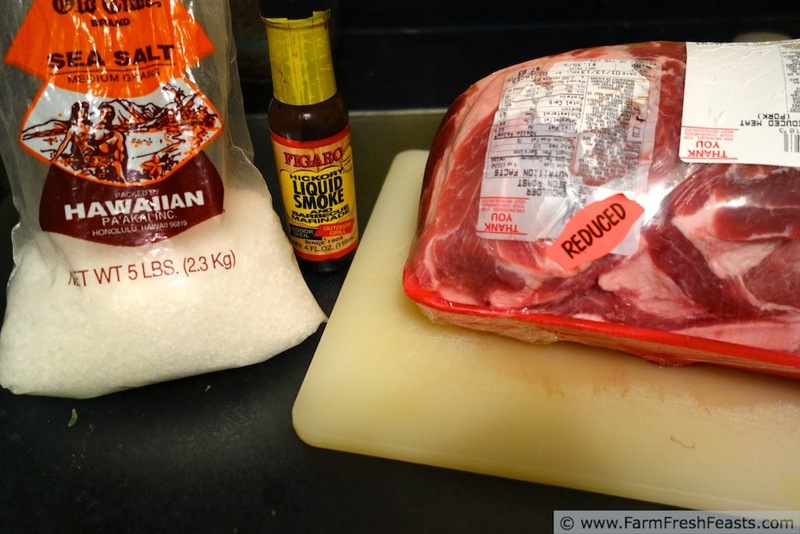 Normally I pack up multiple bags of Pig to freeze, with a little pan juice, so that we enjoy the Island flavors many times over several months. We'll eat our first meal with sautéed cabbage, "2 scoop" rice, and fresh pineapple. Then I get to play with the rest. 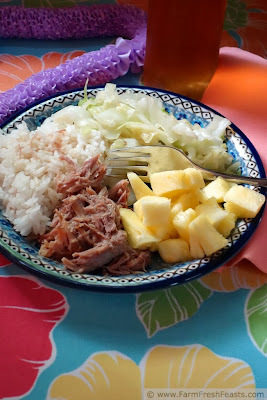 I stick to the cabbage and pineapple sides, though, because Kalua Pig and cabbage is like PB&J to our family. They just go together. For general pizza making hints and tips, please refer to my Pizza Primer post. 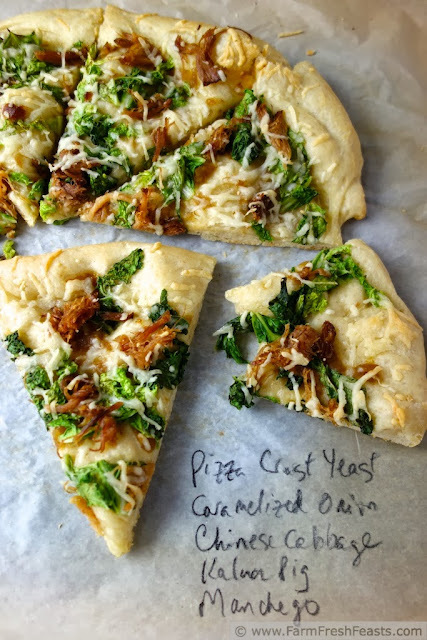 If you're curious about other pizzas I've made, please refer to my Visual Pizza recipe index. Preheat oven to 425 degrees Fahrenheit and if you've got a pizza stone, preheat that as well. Preheat a large skillet over medium heat. That's plenty of preheating for now. Add a turn of oil to the skillet and when it's hot, sauté the cabbage until it's bright green and wilted. Set aside. On an oiled piece of parchment, stretch out the dough in the shape that works for you. Brush the crust with olive oil, then spread the caramelized onions across the top. Scatter the cabbage over the onions, then top with Kalua pig. Finally, spread a liberal amount of Manchego cheese over the whole thing. Bake on the parchment for 5-8 minutes (use a cookie sheet if you don't have a stone), then shimmy the pizza off the parchment and bake directly on a pizza stone, or cookie sheet, for another 3-5 minutes until the cheese browns nicely. Slice with my favorite pizza slicer (this is an Amazon link) and serve with some fresh pineapple on the side. I love that "Kalua Pig and cabbage is like PB&J to our family. They just go together." I'm a fan of sweet pineapple on top of pizza mixed with a salty cheese. There's something about the sweet and salty combo that gets me every time. I'm a big fan of the first picture. There's something about the list (ah lists) of ingredients on the waxed paper which draws me in every time. I should take a photo of the lists of my freezer contents. Then again it's meat, so that wouldn't make you swoon. Just know that there are lists of these things in my kitchen, ok? Now I want pineapple and say feta. That'd be good. Okay this looks out of this world in deliciousness. I haven't mastered the art of pizza dough making, but I can buy the store-bought kind and then make this pizza. It's on my list. oh thanks for the shout out too. Pinning this for later use too. I don't know that I've mastered the art either, but it's fun to practice for sure. You always have the most delicious looking pizzas!! I would love a slice of this right now. YUM! I sure try to make these pizzas look as delicious as they taste. I suppose I'm supposed to say that they are all my favorites, like my kids, but I'd be lying. I'm very partial to My Deployment Pizza, and I'm working on an Everything Bagel Focaccia that, once I tweak it, will be my new favorite focaccia. But you know, this one is good, too ;) (really it's yummy, and will get made again next time we've got kalua pig). Love to make homemade pizza and yours looks fantastic, I can't wit to try it. Thank you for sharing with the Clever Chicks Blog Hop! I hope you’ll join us again next week! I'm delighted to share with your hop. Thanks! This looks so wonderful! I need to make this for dinner soon! Thanks for linking up with What's Cookin' Wednesday! Thank you for hosting! I need to go to a luau, and then make some more pizza.